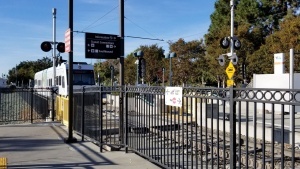 This is the transfer point between Caltrain and VTA Light Rail for destinations such as Great America and Levi's Stadium in northern Santa Clara. This station is served by Caltrain local/limited stop and Baby Bullet trains. Caltrain ticket machines and Clipper card readers are located on the train platforms. All riders must have a valid ticket or tagged Clipper Card before boarding Caltrain and train crews may inspect for fares onboard. Riders using Clipper should "tag off" after exiting the train. This station features side platforms. Use the walkways at north and south ends of the platforms to cross the tracks. This station is the northern end of Mountain View - Winchester line. The light rail platform is located on the corner of Castro Street and Central Expressway (between the expressway and Caltrain tracks). VTA ticket machines and Clipper card readers are available on the light rail platform. Purchase ticket or tag card before boarding. This station features a center platform and trains to Winchester may leave on either track. 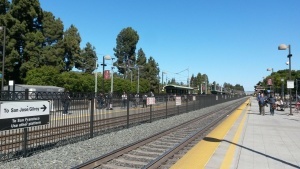 Riders transferring from Caltrain using Clipper should "tag off" at a reader on the Caltrain platform before tagging on at the light rail platform. For events at Levi's Stadium, VTA may provide supplemental bus service from this station direct to the stadium. All buses stops at the Bus plaza except line 81, which stops on Castro Street. Station parking is available on Evelyn Ave. Parking requires a $5.50 daily fee or a Caltrain monthly parking permit. To pay the daily parking fee, remember the stall number and pay at the Caltrain ticket machines located on the station platforms. Parking at the station can be full. An overflow parking lot is available at West Evelyn and Franklin streets behind the Tied House. Special event parking rate may be charged for events at Levi's Stadium. This station features bike racks, 116 lockers and a shared bike enclosure. All are located near the southbound platform. Call Caltrain at 650-508-6350 for bike locker rental. To sign up for the bike enclosure, call City of Mountain View at 650-903-6311. This page was last edited on 4 November 2018, at 23:29.